You may have thought that after a full week of posts we were done with the mudroom. No way! It’s my first finished room. I’m going to savour this for awhile yet. 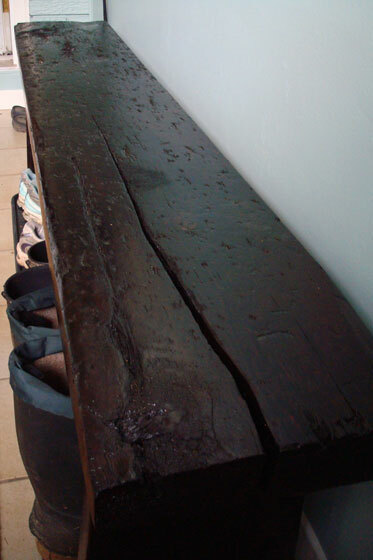 To start, I’m sharing my favourite project, my beautiful beat up rustic wood bench. My nephew Nicholas and I designed it, built it and stained it. It’s made out of one single plank that I found in the barn. I looked for the most beat up piece of wood I could find. It’s full of knots, splits and gouges. We sanded and sanded the bench so that it was smooth enough to sit on, but made sure all of the “defects” still showed through. Unfortunately, when it came to staining the bench, the wood was so thirsty that it sucked up every single drop of stain (Minwax Provincial), so the bench came out much, much darker than we expected. Some of the knots and gnarls aren’t as obvious now because of the dark tone, but I still think it has good character. We designed the bench to some very specific requirements. We wanted the legs to be wide enough that we could put two trays of boots and shoes underneath. The seat had to be a comfortable height for sitting and also high enough that Matt’s tall boots would easily fit underneath. And we wanted it to be relatively slim so that it didn’t take up too much space in the room. My nephew and I went back and forth on the design of the legs and finally settled on a simple upside down V cutout. I used my Kreg jig to attach the legs to the bench top. This was the first project that I used the Kreg for, and I quickly learned that the Kreg is built for standard modern day lumber. This plank was milled back when 2x4s were actually 2 inches by 4 inches, so it’s fatter than today’s lumber. We made the jig work, but it was a tight squeeze in a few spots. It’s a very simple rustic wood bench that’s perfect in a country house. I’ve dubbed it the “Nicholas” after my design sidekick. If you want your own Nicholas, you can’t have the nephew, but you can have the bench. Click here for the plans. Who else has a construction sidekick? Have you ever designed and built your own custom piece of furniture? Are there any other Kreg fans out there? 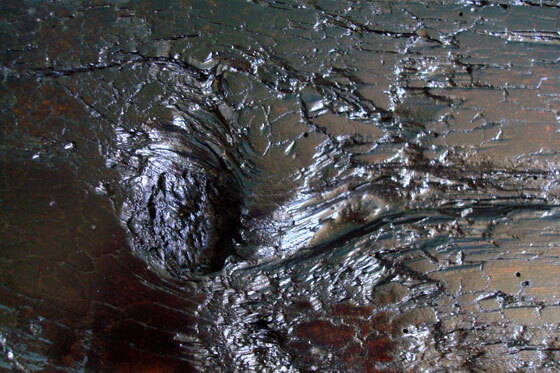 Who else has stained a “thirsty” piece of wood? Are you a fan of the “distressed” look of beat up lumber? I LOVE it! You guys did a GREAT job! Looks awesome! Want to come do my house? Could use some change! Keep the updates coming! Love seeing how you redo your farm! I am still somewhat intimidated when it comes to power tools. But my Dad has built us a few pieces of furniture – our liquor cabinet, faux fireplace mantel, and TV stand. I love every piece. And he is also an artist – other than the kids’ artwork, the only original (and therefore, only) art we have in the house is my Dad’s work, or my photography. Sometime in the very near future, I intend to redo our bathroom. Nothing like renovations, but we did some wall patching that never got painted, and I have always hated the vanity. And it’s small and crowded feeling (espeically now with two kids and their toys!). I was always intimidated by the skill saw. I`d make my Dad cut everything when I was working with him. However, I`ve had no choice but to do it myself since moving to the farm (I`m too impatient to wait for those times that my Dad is around). Using the saw has helped a lot in increasing my comfort with it. I`m still incredibly careful, but I don`t hesitate to pick it up anymore. It`s just like DIY or fixing up a (bath)room. Just start! We LOVE your mudroom bench! It’s exactly the kind of thing we are making at Dockwood Furniture, or nascent-sort-of company. 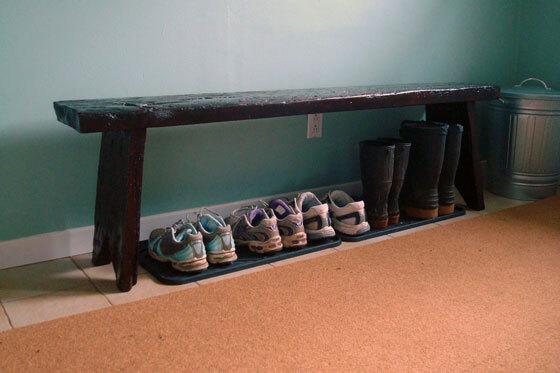 We’ll be posting a photo of our “Hurricane Sandy Single-Plank Mud Room Bench” soon on our Tumblr blog. We hope you’ll check it out. Amazing to find a “kindred spirit” out there! Thanks for sharing your bench. I have to say, I think I love the bed best of all. Such beautiful wood that you work with. I think the simple forms are the best to let the wood really shine. Your bench looks great – wonderful job.